Kate Hewitt brings us an insightful look at the life of Jim Clark, as seen through the eyes of Sir Jackie Stewart when she sat down with him recently. September 10, 1967. A warm, crisp day, with a slight haze – near perfect conditions to stage the infamous Italian Grand Prix. Focused in an off white race suit, with a plain black helmet, staring into the distance, envisioning every twist, turn, bump and bend of the Monza circuit as if data streams were covering his eyes, sat the shy, timid Scotsman, Jim Clark. Disappearing into the lead whilst dancing in sync with Monza’s embankment, Clark’s Lotus – an engineering innovation in its time – had problems. Dropping pace and swerving uncontrollably, Clark hung out of his cockpit to check the issue himself; the Lotus’ right rear tyre was deflating. He plummeted from the lead of the race, to last and a lap down after a trip to the pits for fresh rubber. Dejected and frustrated, with thoughts of reliability hampering what seemed to be another season, the Scotsman tightened his grip to the steering wheel and put his foot down. Lapping seconds quicker than the rest and rapidly catching those in front he catapulted his way back into the lead. With a clear track in front of him and determination lining his vision, a new lap record was secured. The win in sight and the heartbreak seemingly over, Clark’s head was once again frantically tossing and turning in his cockpit, checking dials and switching buttons to correct an apparent fuel pump issue. 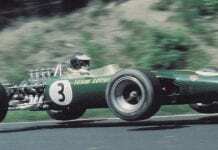 1967 was the year the Lotus 49 was brought into action. An advanced masterpiece in its day, bringing the idea of a specially­modified engine at one end of the monocoque and the suspension and gearbox at the other end to life. An engineering revolution that sparked a true relationship between its creator Colin Chapman and pilot, Clark. Renowned for his superb car control and ability to gently caress a car around any circuit, Clark sits amongst those widely regarded as the sports elites. But years prior to the masterclass shown in Italy in ‘67, during the early days of his Formula 1 career, Clark was haunted by the fatal accident of Wolfgang Von Trips. Blamed for the death of a fellow racer until his name was cleared, Clark returned to his family’s sheep farm. His place of tranquillity, his safe haven, if you will. The 60s were flocked with British talent, sealing six titles in that decade alone – Graham Hill in ’62 and ‘68, Clark in ’63 and ‘65, John Surtees in ‘64 and Stewart in ’69. With several other Brits racing amongst them, it was difficult for home fans to imagine two Scotsmen on the podium together, but Clark’s masterclasses guided Stewart to defy the odds. With driver fatalities almost a norm in that era, this duo were racing whilst explicitly dodging flying death­traps and in Clark’s case, the beheaded body of fellow racer, Chris Bristow in 1960. An event that put him off racing at the legendary Spa-­Francorchamps. But no one expected it to happen to Clark, he was just too good. Hockenheim, April 7 1968. A day unlike any other. In the UK, the motor­racing fraternity were watching the BOAC 500 unfold at Brands Hatch. A six hour sports car race that was full of Porsches, GT40s and Ferraris. Across the seas, in Germany, a small Formula 2 race was beginning its second round. In the 1960s, it wasn’t unusual to find Formula 1 drivers competing every weekend ­as an addiction to adrenaline was a common trait in them all. Denny Hulme and Bruce McLaren were both amongst the names racing at Brands, but the new Lotus racing at a somewhat unknown Hockenheim, was piloted by Graham Hill and Clark. Unlike Britain, that was merely overcast, Hockenheim had been laced with water thanks to heavy rain the night before. Clark, was not having a good weekend and was clearly having some trouble with his car after qualifying in seventh. Fighting against his steering column, using up every last inch of strength he crossed the line in eighth place to start his fifth lap of the Deutschland Trophy; it was a lap that would never be finished. Whilst Graham Hill was amongst those searching through the wreckage for answers, the world stood still. In shock. In disbelief. In horror. For this could not have been driver error. Every era has a hero. Every year has a new star. Juan Manuel Fangio in the raw, early monsters. Ayrton Senna in cars with mass power and minimal downforce. Michael Schumacher in the highly mechanized machines. Sebastian Vettel during the fancy aerodynamics. Lewis Hamilton with the hybrids. Clark wasn’t just a hero in his day. He was the benchmark. He still is. The one who secured 33 pole positions, 32 podiums and 25 wins in just 72 starts. He never intended to make racing a way of life, let alone become someone considered as the best to have ever raced in the sport. Such finesse, such genius, all hidden under the humble name of Jim Clark. Someone fondly remembered not for his demeanor, but for his unmatchable talent.